Mission Convalescent Home offers a wide variety of services. 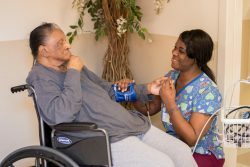 We offer a wide variety of services in a home-like environment to meet your healthcare needs: Intermediate Care Skilled Care Rehabilitation Care Restorative Care Wound Care Treatments We participate in Medicaid, Medicare, VA, and are approved for Various Private Insurance. Please contact our business office for details.